There are many families known for a tradition in the sport – the Hasketts and the Gunstones in Dundee, the Martins in Dumbarton and so on. Anna Poulton came from such a background. Her father John McClurg was one of the best known and respected in the sport. He worked with his own club, he was on the SAAA Committee (as representative of the National Association of YMCA’s)and several sub-committees and was one of Britain’s best timekeepers. I knew him as a member of the SAAA General Committee in the late 70’s – he was first elected to the Committee in 1960 and when I was elected in 1977, he was John McClurg, BEM. He was a Grade 1 Track Judge as well as a timekeeper known the length and breadth of Britain.,and also the man in Scotland involved in grading timekeepers and was an Honorary Member of the SAAA. He had been President in 1968 as the representative for Motherwell YMCA. His daughter Anna followed in his footsteps. One of the really nice things about their officiating career is this. In 1970, John was Chief timekeeper at the Edinburgh Commonwealth Games while Anna (by now Anna Poulton), along with Duncan McSwein, George Dallas and Raymond Hutcheson, was one of his team of timekeepers. At the 1986 Commonwealth Games in Edinburgh, Anna was Chief Timekeeper and among her team, which included Duncan McSwein, was John McClurg. They had each been chief timekeeper at a commonwealth games and they had each worked under the other as a timekeeper at a commonwealth games. It must have been a source of great satisfaction to both of them. 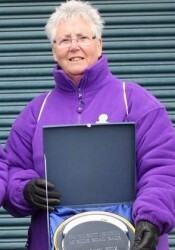 Anna married John Poulton – one of the regulars in the great Motherwell YMCA team of the 1960’s. His first run in the Edinburgh to Glasgow Relay was in 1958, his last was in 1966 – many of the top runners defected to Law and District in 1967 – and he won team medals of every colour as one of the squad. He also won gold over the country including in the National. The best single account of her career in the sport came in a blog that she wrote for the Scottish Athletics website on 12th January 2010, and I reproduce it here. That was in 1964 and I have been doing “something useful” (with a watch) ever since. To be graded at that time you had to have three watches: one 1/10th of a second for sprints, one to 1/5th for 880 yards upwards on the track, and then a time of day chronograph for any races out with the Stadium. These watches had to be sent to the National Physical Laboratory in London to be tested as per the set rules of the day. I think that’s why all “older” timekeepers are round shouldered, bearing the burden of all these watches. Several years prior to the 1970 Commonwealth Games in Edinburgh, a meeting was held of all officials – the SAAA East/West/North and Borders, plus SWAAA – at which a committee was formed with one representative from each area, plus a representative from each discipline. This was the beginning of the original Training Committee. Sub committees were then raised for each discipline to raise the standard of all officials for the Games. Going on to the 1986 Commonwealth Games where I was Chief Timekeeper with JO Scott, you can imagine the laugh we had when it was discovered that the seats for the timekeepers had again been sold to the public. This time there were only 15 timekeepers (photo finish had started by then) and we were given a raised dais in front of the stand. Back then, it was thought that timekeepers would be redundant by today, but we’re still required. So a message to all you budding timekeepers – get to the training courses – you’re still required – there are very few meetings at local and international level where the photo finish has worked 100 per cent. What would we do for Cross Country, Road Races etc if we had no manual timekeepers??? but give me my “wellies,” a waterproof suit, and stopwatch (only one required now!) and I’m happy, no matter where it is, what level it is, and how bad the weather is! I have separated out the different meetings just to emphasise the range of work undertaken. Anna was a pleasure to work with – when I did the basic Timekeepers course, we were all given specific advice and were told to bring our sense of humour to every meeting. We smiled politely and went on our way. It soon became evident that it was a necessity when we met the conditions encountered by all track officials. Anna always had her sense of humour but was probably the most professional official I ever worked with – a hard call to make given the number of quality men and women we have officiating at our meetings. Anna died on 29th December 2013.